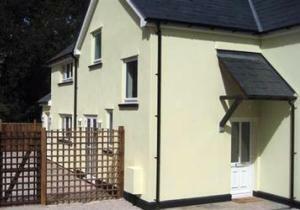 2 Ancre Hill Cottages01600 714152work Self-cateringThe cottage sleeps up to 6 people in three double/twin bedrooms. The master bedroom has an ensuite shower room and there is also a family bathroom with a bath and separate shower cubicle. The kitchen is fully fitted including fridge/freezer and dishwasher, and the adjoining utility room contains a washing machine and tumble dryer. The spacious lounge has ample seating with a tv/dvd player and a selection of dvd's, boardgames and books. The sun trap patio has a gas barbecue, and guests have access to a tennis court (equipment supplied). The cottage also has wifi internet access. All linen is provided, all of which is 100% cotton. On arrival guests are greeted by a welcome hamper with a bottle of Estate wine, and discounts on Estate wines are also available for guests. Situated in the heart of the Wye Valley, an area of outstanding natural beauty, there are a host of activities for the discerning visitor. Cycling: wonderful cycle tracks in the area, with secure storage provided at the cottage for your bikes. Golf: at The Rolls of Monmouth and St Pierre, Chepstow, and only 20 minutes from The Celtic Manor, home to the 2010 Ryder Cup. The cottage sleeps up to 6 people in three double/twin bedrooms. The master bedroom has an ensuite shower room and there is also a family bathroom with a bath and separate shower cubicle. The kitchen is fully fitted including fridge/freezer and dishwasher, and the adjoining utility room contains a washing machine and tumble dryer. The spacious lounge has ample seating with a tv/dvd player and a selection of dvd's, boardgames and books. The sun trap patio has a gas barbecue, and guests have access to a tennis court (equipment supplied). The cottage also has wifi internet access. All linen is provided, all of which is 100% cotton.